Years ago, they were the best of friends. But as time passed, they grew apart, became adults with families of their own, and began to forget about the past – and the terrible lies they shared. Could their long-ago lie be the reason for their troubles today? Is it more dangerous to admit to what they’d done or is it the strain of keeping the secret that is beginning to wear down on their souls, is it more dangerous to admit to the truth? 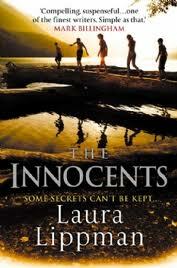 I would describe The Innocents as a ‘beautiful’ crime book, as it proves that the genre is broad enough to take in such works where the body count is low, the bloodletting may be disappointing for some, and yet it’s all the more powerful for it. The jacket of the book and the central theme of a group of adolescent friends who live out every day with each other and share their troubles, ups and downs and create their future memories together, could not help but make me think of Stephen King’s ‘The Body’ which was adapted into the movie ‘Stand by Me’. And, in terms of great storytelling style and character building, this is right up there with the best of King’s work. I loved the idea of the gang of friends referring to themselves as the ‘starfish’ but it’s the pentagram shape in the centre of their five points, in the form of ‘Chicken George’ – an old man they discover in a run down shack – that really shapes the events of the story and leads to a tale which etches its way indelibly into each of their lives and into their adulthood. With events in the late seventies and the gang referring to themselves by Star Wars characters’ names when they first meet Chicken George, this is a lovely nostalgic look back to a place and time, but one which has a dark and ever widening shadow which threatens to damage them in later life from actions taken in their younger years. As well as an acknowledgement section at the back of the book in which the author explains how this is likely the most autobiographical novel she has written, Lippman then goes on to add a further ‘explanation’ section. In this she makes reference to the unusual use of the first-person plural in sections of the book and how that has confused and frustrated some readers whilst leaving others with an air of further mystery to the book. I’m pleased to report I am one of the latter. I loved it, for all its youthful fun and then adulthood trauma, for the areas of intense clarity and for those times where the mystery may well have fogged the details, I loved it all the more. Laura Lippman will be at the Theakstons Old Peculier Crime Writing Festival this month. You can see a video about the book here, and you can order your copy of the book here. I thought I had read all of Lippman’s books. Somehow I missed this one!